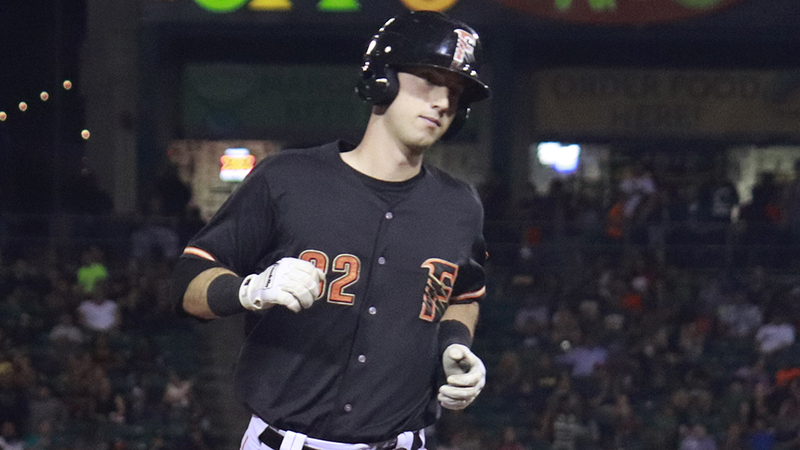 Kyle Tucker's week began on a sour note when he was optioned from the Majors back to Triple-A Fresno last Tuesday. Now, he's playing a significantly happier tune. The Astros' No. 2 prospect has been named Pacific Coast League Offensive Player of the Week after going 14-for-25 (.560) with six homers, 13 RBIs, nine runs scored and three stolen bases in five games following his return to the Grizzlies. This is Tucker's third career Player of the Week honor and his second this season after being honored by the PCL on June 25. The sweet-swinging left-handed slugger had multiple hits in all five of his games last week with the Grizzlies. His 14 total hits were tied with Eloy Jimenez for most in Triple-A last week, despite the fact that he didn't play Monday or Tuesday, while his six homers tied for tops among all Minor Leaguers with Double-A Erie's Josh Lester. Of all Tucker's half-dozen homers, none were more important than the one he stroked Saturday night. With his team down 6-4 in the ninth inning against visiting Salt Lake, MLB.com's No. 8 overall prospect smacked a three-run shot off southpaw Conor Lillis-White, who has held opposing left-handed Triple-A hitters to a .185 average this season. The 7-6 win over the Bees gave the Grizzlies the PCL Pacific Northern Division title. "He's one of those guys, and I've said it before, you're going to talk about him for a long time," Fresno manager Rodney Linares told MiLB.com's Vincent Lara-Cinisomo after Tucker's heroics. "He reminds me of [Alex] Bregman. Pressure doesn't get to him." That was evident again the very next day when Tucker delivered another walk-off hit, this time a single to left field in the 10th inning of Fresno's 10-9 victory over the Bees. Following his big week, the 21-year-old outfielder is hitting .327/.387/.580 with 23 homers and 20 steals in 94 games at the Minors' highest level. His .580 slugging percentage is best among Triple-A qualifiers, while his .967 OPS and 148 wRC+ both place third. So even while he's struggled to carry that production to the Majors -- where he's hit .154/.254/.212 over 59 plate appearances in two stints with the big club -- those around him in the Astros organization have expressed little concern about his ability to contribute in a big way soon. "His bat-to-ball skills are second to none. He's really impressive to watch," Grizzlies skipper Rodney Linares told MiLB.com's Andrew Battifarano last week. "You can see him hit in a game and it looks like he had never hit in his life -- he can get fooled by three breaking balls in a row. But if comes back up again, that breaking ball better be in the dirt because if not, he's going to hit it out of the park."